See all the projects in the book on Ravelry. A friend of mine, Kim Haesemeyer has recently published a book with Leisure Arts—Expand Your Knitting Skills, and sent me a copy. The book is full of accessory patterns great for the beginner knitter who is ready to reach out into some more advanced techniques, like cables, seaming, picking up stitches and simple shaping. The seventeen patterns include hats with matching scarves, cabled fingerless mitts, and a cabled bag. I've fallen in love with the Lucky Horseshoe Hand Warmers and am in the process knitting up a pair for myself, using Lisa Souza's Hardtwist Merino yarn in the Portsmout color. These cute and cozy fingerless mitts are each knit in two pieces. The top part has the cable panel and goes on the back of the hand, and there is a bottom part that is all worked in ribbing and is seamed to the top part leaving an opening for the thumb. I'm knitting both the tops at the same time, so I can be sure to work them the same. The pattern is very easy to follow, with the instructions written out row-by-row—and it knits up a lot faster than I was expecting! Kim has kindly offered to give away a free autographed copy of her book to one of my blog readers! If you'd like to win a copy, please leave a comment below and I will choose a winner randomly in a few days. 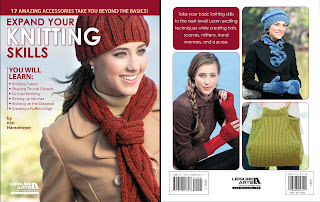 Expand Your Knitting Skills is available at JoAnn Fabrics, Michaels, Barnes and Noble, Leisure Arts and Amazon.com. Or, you can order a copy directly from Kim. Leisure Arts is also offering it as an e-book. This looks like a wonderful book\. Thank you for the generous giveaway! All the questions when I am knitting in a book. How wonderful. Especially it would be great for when there is not a resource nearby (such as a store open). Congrats! The random number generator picked number 3, and since you're the third comment, you've won! Please email me at knitt AT kristentendyke DOT com so we can get a copy of this book sent to you. Congrats!!! Great idea Julie! I'll make a plan for that! Thanks for the giveaway! I'd love to have a reference for some of these topics to refer to while knitting! I've also have fallen in love with the "Lucky Horseshoe Hand Warmers". My goal is knitting cables/anything cabled. They are classic. I only, recently started knitting again after 40 years. My first try, many moons ago, was pot holders in Brownies. My first project recently was a cowl. Knit stitch/chunky yarn but I am pretty proud of my patience. Would love to win this book. Looks like I'd like to attempt/ finish all...because that cable on the hand warmers is the nicest pattern I've seen. Thanks everyone for your comments! The contest is now closed.